The second NUT Supply Teachers' Conference is taking place at the NUT national HQ in London today. Supply teachers have been at the sharp end of privatisation for too long. As direct employment through Local Authority pools has been replaced in most areas by profiteering private agencies, supply teachers have seen their pay slashed. Legislative changes (consistently opposed by the NUT) allowing schools to use non-qualified staff to cover classes have also threatened their job security. Of course, this fragmentation and privatisation also threatens children's education too. A well-supported survey of NUT supply members has shown a continuing decline in LA-run supply pools. Less than 5% of teachers now say they mainly obtain work via LA-run pools. Over two thirds now mainly obtain work via agencies or agency-run LA pools and the remaining 25% obtain work directly from schools. The number of agencies continues to grow, further fragmenting provision. Overall, it is estimated that there around 500 nationally. The biggest operators include Teaching Personnel, Randstad Education, Hays, Protocol and Capita. Contrast the massive salaries and bonuses paid to those running these outfits compared to the pay-rates going to agency staff! These agencies can of course make an easy profit out of school budgets - typically £50 a day for placing a teacher in a school - because they don't have to pay the STPCD rates of pay that still apply to most permanent colleagues. Almost half of those surveyed reported a regular daily rate of just £100-125 and a further 16% report a regular rate below £100. Of course, these rates are a good way below what the agencies charge schools. Remember, this income also has to sustain supply colleagues through their holidays too - and, of course, there's no sick pay entitlement either. That's a scandal that needs to be better publicised. The survey also suggests that supply rates are being driven downwards - 42% say they are being paid lower or significantly lower pay than they were for supply teaching three years ago. Work is still available - perhaps reflecting the growing turnover in schools - but some colleagues reported teaching work being offered to them under the guise of lower-paid employment as a "cover supervisor". A colleague reporting from a visit to the USA made clear that these attacks are an international phenomenon too. Supply agencies cannot offer their employees access to the Teachers' Pension Scheme at present. The NUT survey shows that many agencies have now begun to offer access to a workplace pension scheme, under new requirements on employers. These are, however, markedly inferior to the TPS, with contributions as low as 1% from the employer and schemes available only above a certain earnings threshold. The NUT has been successful in securing portability of Disclosure and Barring certificates. It seems, however, that some agencies are not taking steps to apply this portability in their practices. The NUT has launched a Charter for Supply Teachers setting out demands on LA pools, pay and pensions. The Charter also refers to the importance of workplace support for supply teachers. The most frequently cited problems relate to individual pupil information, teaching resources and planned work for students. The Conference discussed plans to strengthen organisation to win gains for supply teacher members. One suggestion is to develop an NUT 'Kite Mark' for agencies, depending on the pay rates that they offer teachers. This could set down basic entitlements for negotiation with agencies and act as a basis for campaigning and pressurising agencies to improve salaries. The Kite Mark could also include other matters like pensions, CPD and DBS portability. While all the supply teachers in my workshop agreed we should certainly 'name-and-shame' the worst agencies, some wanted further discussion on whether awarding a Kite Mark to an agency that is still paying under the statutory rate was a wise move. Having a 'gold', 'silver' and 'bronze' award might be a way forward. There were also requests for legal advice on a range of issues specific to supply teachers including 'finders fees', unpaid work, national insurance contributions and support over complaints. Support was given to proposals for a Lobby of Parliament in the October half-term to publicise these issues and also for building supply teacher organisation within the Union. For example, London teachers proposed holding a regional supply teachers' network meeting in September. 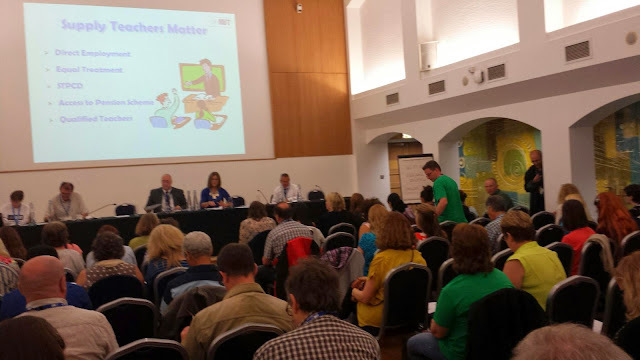 The big turnout at the Conference, and the anger and determination expressed from the supply teachers present, shows how the supply teacher network and campaigns must continue to build and strengthen. 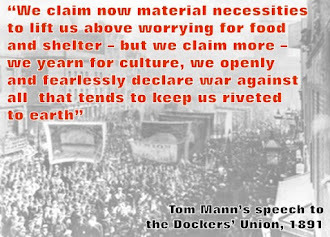 The National Union now has a responsibility to make sure we do everything we can to put these plans into practice.